Healthcare environments are complex environments. Patients and caregivers may need to go to several locations within a facility in a single visit. Although way finding appears to be a simple exercise, it is a complex activity with significant and measurable impact on users. It all begins in the name. Ortho One was keen they be called a ‘Speciality Centre’ instead of a hospital. 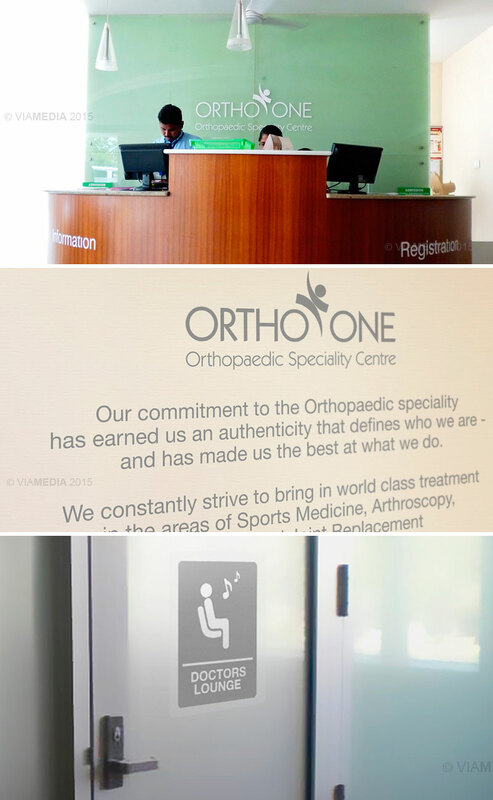 What had started as a clinic had now grown to be an Orthopaedic Speciality Centre that specializes in non-trauma Orthopaedic care with a special focus on Sports Medicine, Paediatric Orthopaedics, Joint Replacement Surgery, Spine Surgery, etc. The client envisioned the new facility to be a simple, pleasant yet thoughtful environment that would break through the general clutter of the Indian healthcare setting. When Patients and caregivers arrive at a facility they are most often in a vulnerable state. Studies indicate that unclear signage can have an overwhelming impact on patients and further heighten their existing state of anxiety. Patients and caregivers may need to go to several locations within a facility in a single visit. Although way finding appears to be a simple exercise, it is a complex activity with significant and measurable impact on users. Good way finding systems can reduce the stress of patients and caregivers, and make the healthcare journey user friendly from start to finish. The project used a design thinking approach, and began with a thorough understanding of the needs of the stakeholders across the entire facility, identifying key user pathways and destinations. 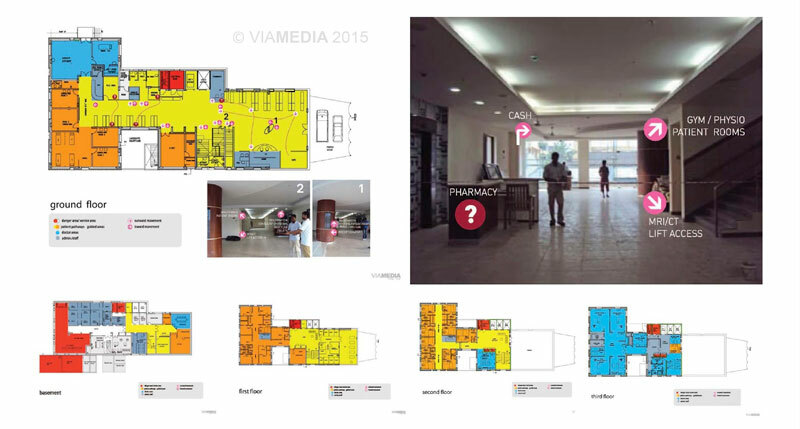 Information was designed using a progressive disclosure approach commonly used in airports, where way-finding and signage guides the user only with the information necessary to get to the next decision-making point. 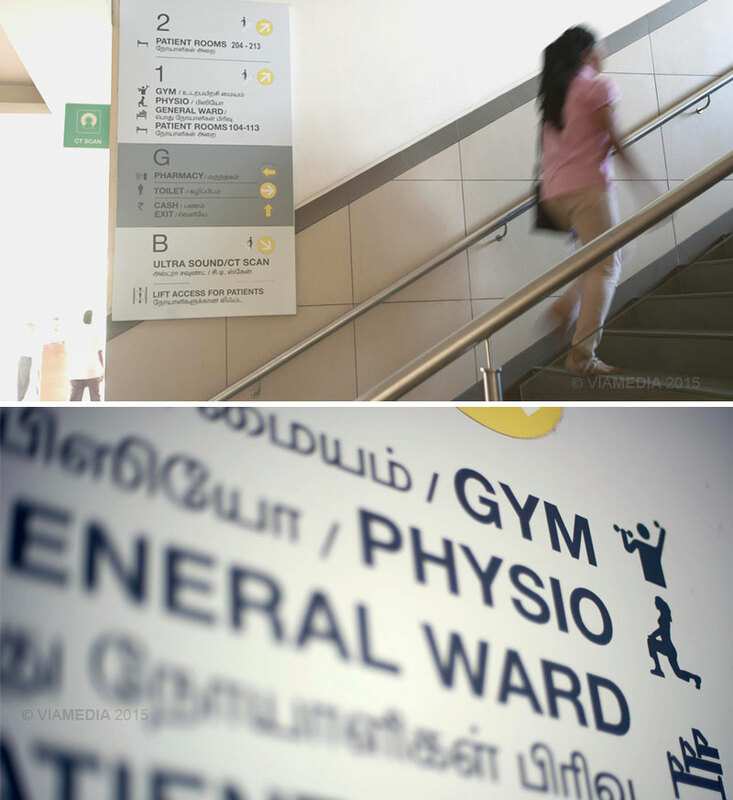 Way finding and Signage design also influences the overall image and experience of the facility. Content design and styling, viewing distance, choice of font, readability, colour palette, lines of sight within the orientation of patient pathways influence how information will be consumed, and make for user friendly design. Fostering patient care through familiarity and consistency across the entire facility. Hospitals are beginning to focus on the physical environment as a tool in health and healing- not only for patients benefit but also for healthcare workers too. Well designed spaces can make us feel comfortable, reduce our fears and offer us trust. Improving the quality of care for patients with the design of caring environments. This began with zoning and demarcating the physio from inpatients spaces. 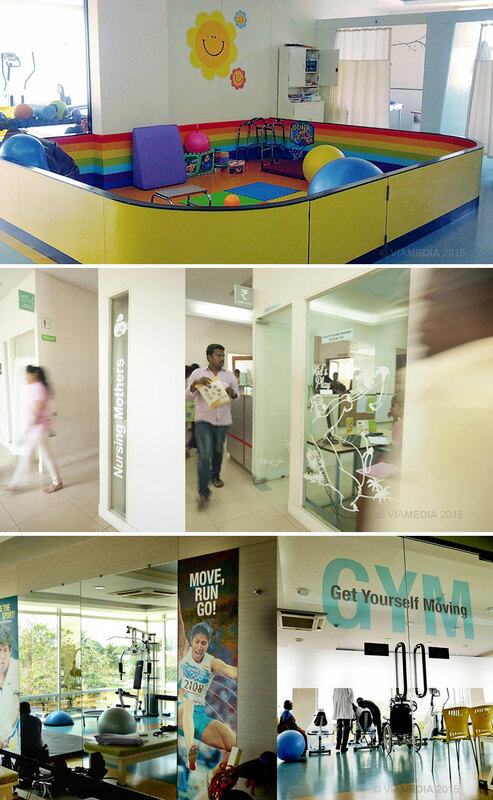 The Kids Physio was designed to be a space that was positive and motivating. A bright and happy space for children that would alleviate the fear that generally surround a hospital environment, a space that they would be happy to go back to. It was important that the design of the physio space extended to the adult physio too. Visual graphics to offer a pleasant distraction. A pastel colour palette with support graphics were designed to offer adults physical comfort and emotional support. The gym was designed with the intention that positive attitudes can influence better recovery. 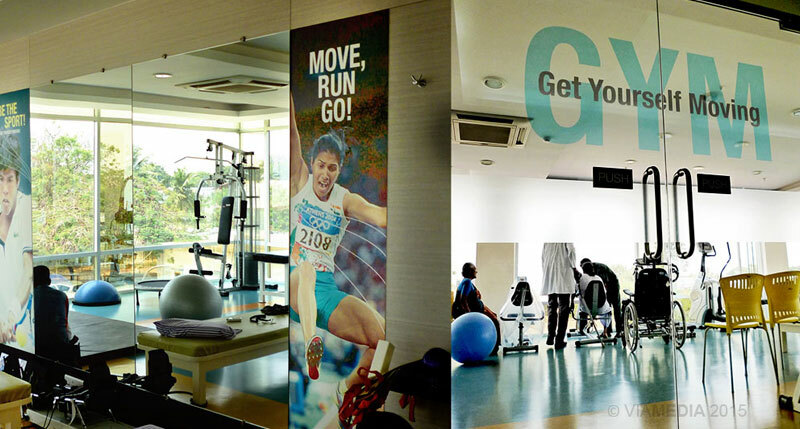 A ‘Get Yourself moving’ theme was created for the GYM, with visuals of top athletes were used to direct energy to positive scenarios. A place that would make athletes feel like less like patients and offer them motivation as they recover and get back in the game. ‘Hope, Healing & Care’ was designed to be the positioning message, one that aptly reflected the values of the organization. To guide a patient journey from start to finish, and carry the values of the organization - Hope, healing and Care into the environment. The thoughtful design of environments reflect the care and commitment and of the organization of putting patients first, and will directly influence and improve the quality of healthcare experience.